We are very careful about the beginner magic we stock. We want it to be the kind of magic kit you can give your own child and be proud of...the kind of material that can plant a seed of magic that will last a lifetime. Fantasma's quality is good, and the the thought that goes into their design is tremendous. Any kid would be lucky to have this old-school set! 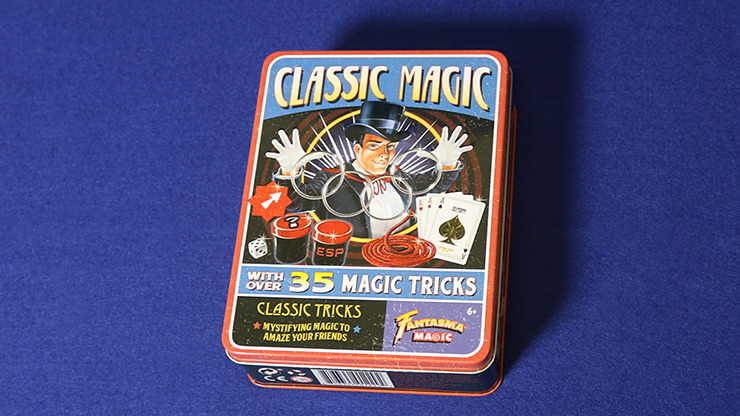 The Fantasma Classic Magic Set is part of Fantasma's Retro Magic line! Over 35 classics of magic in a sleek metal tin! Pass solid through solid with The Linking Rings! Fool 'em again and again with the Jumbo Three Card Monte! Show off your psychic powers with ESP Dice! Astound them with Magic Rope! They won't know whether they're coming or going with the Crazy Arrow! And so much more! All Fantasma sets are endorsed by the International Brotherhood of Magicians -- the only magic products on the market today to carry this seal!